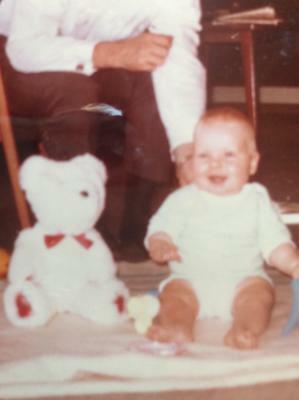 I had a bear as a child that I was forced to part with during a move in the early 1970's. This bear was purchased in Stockdolm, Sweden by my father in the winter of 1964. The bear had four red paw pads that I believe were made of leather and the bear originally came with a red bow, that I don't think was sewn on, but was tied. He had white curly thick fur that was of a high quality- I know it was fluffy when new and did compact a bit with time, I wonder if it may have been real lambs wool or alpaca. The bear was filled with string sawdust- is it known as elixir? This bear's body was densely stuffed, and was hard, not soft. Even with time, this bear kept his shape well, and sat straight up. He was jointed at all four leg joints and between the head and body I think (I know this for sure as one of his arms came off and this is one reason my parents didn't think he was worth bringing along when we moved from one country to another). I remember this bear having a bit of a hump on his back, but I don't have any pictures that verify this memory. He had a black rubber nose that I still have. I don't think he had any tags. His eyes were black, and when new, the eyes were difficult to see due to his thick fur- they were possibly manufactured of glass. 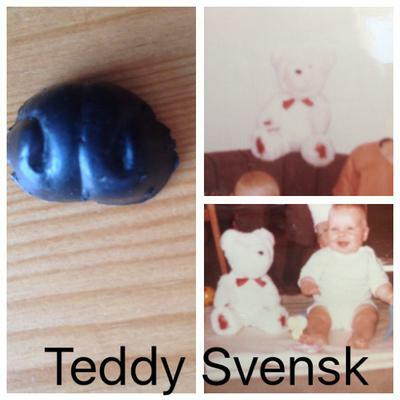 My guess is that Teddy Svensk was around 20 inches/50 cm tall. I have been looking for information around this bear for many years, but apart from where he was purchased and the pictures I have, I don't have much more to go on. I am assuming he was manufactured in Europe. I had originally thought Sweden but I have not found much information on Swedish teddy bear manufacturers. From what I have researched on bears, he doesn't seem to resemble any German bears that I have seen. If anyone has information about this bear. I would be forever grateful- I would love to try to replace this beloved childhood friend. Thank you, Di. I have been looking for 20+ years, I feel like it shouldn't be that difficult, but it is proving to be!